Once again, I'll point out that the "single typo" was a very minor part of the overall problem with the experiment. Agreed. It's just that you didn't have any other problems that stood up to basic scrutiny. But I appreciate, at least, that you've finally caved and accepted that the typo was a tiny issue. Perhaps you could give a specific reason why the other evidence I presented doesn't stand up to scrutiny? Hiding behind blanket statements bespeaks bias. Here, I'll sum up the evidence for you. For clarity, you can address a specific piece of evidence by number. 1. The beach Tom claims to be able to see is 23 miles to the North. 2. The beach he provided a picture of is 4 miles to the West. 3. The beach 4 miles to the West is the only beach visible from his specified location, due to a rock outcropping obstructing the view. 4. Even if you circumvent the rock outcropping, the beach 4 miles to the West is the only beach visible in all the user-uploaded panoramas of that location. Remember, Tom claimed he could see the beach with the naked eye. 5. It is doubtful that a telescope can provide the details that Tom claims to see over a distance of 23 miles. Tom avoids providing any details of the telescope he uses. And why argue about which beach? Tom! Were you lying on the sandy or rocky beach? Yes, let's pretend that I haven't already done that multiple times in multiple threads (Seriously, you guys would benefit greatly from organising yourselves. Frankly, I'd benefit too. Perhaps that's why you're avoiding it?). That sounds like fun. *sigh* All right, one last time. We've already talked through that one. That image is not (and never was) part of the Wiki article for a reason. It was sloppy of Tom to grab random images from the Internet, but it really doesn't matter as much as you'd like it to. Irrelevant given the above. You insist on assuming the wrong beach as "the specified location". I'm sorry, you'll have to provide some evidence to the claim that the beach can't be seen with the naked eye on a clear day. Given that your claim about panoramas is demonstrably false, this will be a considerable challenge. Thanks for handing me the answer to that one on a silver platter, I might not have thought to check the panoramas before you mentioned them. I'll refrain from calling you a liar for just one moment and give you a chance to explain yourself... or will I? Unfortunately, "I doubt it!!!" is not a convincing piece of evidence. As I said, I've addressed all your concerns and resolved ones that were in any way significant. You've now hit the level of desperation of just restating your claims over and over, hoping that my answer will somehow change. The answer will not change unless new factors come into play. As mentioned in your S&C thread, it is blindingly obvious to me that you're trying to get the article removed because you don't want people to see it, and not because of any actual issues with the article. That, in and of itself, is quite possibly the best endorsement of the article I could imagine. You claimed my evidence doesn't "stand up to scrutiny", but you haven't actually shown how any of the evidence is invalid (except #4, which I will address specifically). Your objection to my evidence seems to be based on a desire to give Tom Bishop the benefit of the doubt. This goes against the spirit of a scientific experiment. If there are inconsistencies in the report of the experiment, then the results of said experiment need to be called into question. The worst thing you can do is ignore the inconsistencies, and just assume that it was done correctly. Your graciousness is overwhelming. Good for you for double checking me though. In my defense, I was using a rather old LCD monitor with bad color reproduction, and the silhouette of the landscape wasn't distinguishable from the sky. I will concede that on clear days, it is possible to distinguish a vague silhouette of the landscape. That being said, my point still stands. The BEACH is certainly not visible in those images, as Tom states. Compare that with this image that Tom provided where the beach IS clearly visible. If Tom really was looking in the correct direction, it seems doubtful that he would mistake those two beaches. It seems much more likely that he was simply looking at the wrong beach the entire time. Woody went into more detail elsewhere. I'm not an expert on spotting scopes, but Woody made a fairly convincing argument, and Tom has continued to avoid providing details of the telescope he used. I am well aware that we had this discussion already, and I was not expecting a different result from you. You want to give Tom the benefit of the doubt. Good for you. Normally, I am all for giving people the benefit of the doubt, but in this case, the evidence is way to strong. I made this thread for general visibility of the issue, not to convince you specifically. At this point, it would be most helpful to hear from Tom Bishop himself, but he has been conspicuously silent on the issue. IMHO continuing to ask for more to be edited in the wiki is a waste of time. We could argue the entire wiki should be deleted. The "100 Proofs" like the reason why a geodetic survey is not needed when building rail lines, roads and canals is a good example. The reason is very simple. These things are not being constructed and then set into place. When you construct these things they follow the curvature of the Earth as you go. Which means you only need to conduct plane surveys to ensure the relative elevations or what the designs call for. They changed something that I think no matter your belief in the shape of the Earth could be agreed upon. A mile is a mile in both models. I do not see coming to an agreement how far and the amount of details someone should see using optics currently available. From my point of view during my service in the military and experience sailing Tom has access to some really great optics that are far superior to any I have ever used or aware of. Somehow he got hold of a telescope that allows clear views and show amazing details at magnifications above 60x despite atmospheric interference. There is a reason astronomers like to avoid making observations near the horizon. My personal recommendations is keep things vague in the wiki in the future like most already there and these issue will not arise. The reason myself and others can bring up these issues is Tom gave us too many details. If you notice other mentions of similar things in the wiki omit at least one or more important detail. Like height of the observer or general location the observer was at. So if Tom would have left out where he made the observations from there would have be no way to verify the distances to see if they were correct. No way for anyone to question where and how he was able lay down and place the telescope only 20 inches above the water. Like the make and specs of the telescope another question he has failed to answer. Someone understanding the methodology used would understand the professor had to use math to flatten out Kansas because the assumption it is located on a globe. "Barring the acquisition of either a Kansas-sized pancake or a pancake-sized Kansas, mathematical techniques are needed to do a proper comparison"
"One common method of quantifying ‘flatness’ in geodesy is the ‘flattening’ ratio." "...earth is slightly flattened at the poles due to the earth’s rotation"
ellipse, arc, semi-major axis, semi-minor axis, global, ellipsoid, polynomial line, polynomial equations. So when you look at the methodology the conclusion is the topography of Kansas is flatter than a pancake not that Kansas is sitting on a flat Earth. That article was either posted as evidence to intentionally mislead people or the person linking it did not understand the methodology used and just saw the word flat in the title. If we hold the FES to too high of standard for evidence that is allowed in the wiki they would have no wiki. Just an aside on railroad tracks. An old magazine article (1900's) describing the Texas Electric Railroad (Interurban) describes the tracks as being "on tangent." Your evidence is not invalid, merely inconclusive. As such, it does not stand up to scrutiny, and you, as the claimant, have to step up your game. Your objection to my evidence seems to be based on a desire to give Tom Bishop the benefit of the doubt. Incorrect. It's based on the lack of desire to give you the benefit of the doubt. Your posts are riddled with "errors" along the lines of "I didn't see that thing that's extremely visible, while conveniently claiming that said thing can't possibly be seen" or "there is only one beach he could be looking at. What's that? There's another beach that fits the story much, much better? Ha, what a silly mistake I've made!" I'm sort of omitting your alleged unit conversion mishap, since you've corrected yourself before anyone had a chance to even call you out. I'm only giving you enough benefit of the doubt to openly accuse you of gross incompetence. Unsurprisingly, my actual feelings on the matter paint you in a much worse light. This goes against the spirit of a scientific experiment. Surely you understand by now that FET is a thoroughly unscientific discipline. We're zeteticists, not scientists. If there are inconsistencies in the report of the experiment, then the results of said experiment need to be called into question. The worst thing you can do is ignore the inconsistencies, and just assume that it was done correctly. Indeed. It's a good thing that the experiment is so easily reproducible with good results. Good for you for double checking me though. In my defense, I was using a rather old LCD monitor with bad color reproduction, and the silhouette of the landscape wasn't distinguishable from the sky. I will concede that on clear days, it is possible to distinguish a vague silhouette of the landscape. Well... at least you've admitted it now. It's something. That being said, my point still stands. The BEACH is certainly not visible in those images, as Tom states. I disagree. It's quite clearly visible. Compare that with this image that Tom provided where the beach IS clearly visible. Ah, yes, let's talk about the image again. That's always fun, saying the same thing over and over again. The image was randomly grabbed off the Internet. It was a stupid thing of Tom to do. It was never part of the original experiment description, but you insist on pretending that it was. We will not reach common ground on this, and I will strive to copy-paste this exact string of text if you ask me about the picture again. If Tom really was looking in the correct direction, it seems doubtful that he would mistake those two beaches. It seems much more likely that he was simply looking at the wrong beach the entire time. I disagree. Sandy beaches in the Monterey Bay area are fairly similar. It's mostly sand and seagulls. A wordy statement of disagreement is still just that - a statement of disagreement. Restoration of obscured objects with telescopes is a trope within FET experimentation, and again, it's one that's very easily reproducible. If you doubt it (wordily or not), I'd suggest you have a go. Why take it from us? I will continue to invite you to present your evidence. To date, that simply hasn't happened. I made this thread for general visibility of the issue, not to convince you specifically. Ah, yes, because the other five threads where we've had the exact same discussions and where your lot have made the exact same errors weren't enough public exposure of "the issue". Notice how the beaches ARE clearly visible in the bottom 2 images, as Tom stated. 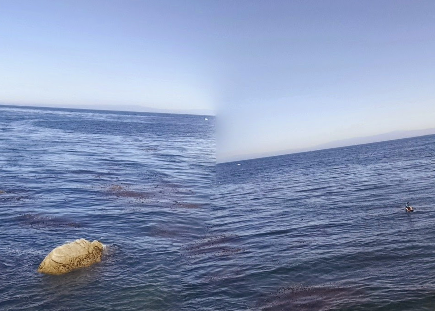 If he really had been looking at the beach from the top image during his experiment, it seems extremely unlikely that he would have confused it with the beaches from the bottom images. Again, I don't really expect to change your mind, nor is that my goal. At this point, it would be most helpful if Tom himself would address the issues. Clearly we disagree about what the word "visible" means. We're both seeing a thing, that much we've confirmed. We are both able to perceive it with our vision. But to you, it's not visible. There is very little I can do to help you with that. Again, I don't really expect to change your mind, nor is that my goal. Neither is it mine to change your mind. At this stage I'm just exposing your "concerns" for what they are. Alright, I'm sure you have a cleverly thought out reason as to why this technically isn't a straight up lie. Is this going to be like that other thread, where you argued that we are all temporarily immune to being hit by a bus, since there is no bus hitting us in this exact moment? Instead of derailing the thread with a long, drawn-out argument full of tedious equivocations around the definition of the word "visible", how 'bout you just tell us your clever rationalization? Impress me. There's no rationalisation. The coastline is visible. You admitted it. You provided images to support it. But simultaneously you're claiming you can't see it, originally blaming a crappy monitor. I admit that I can see a kitten here, but there are no visible, let alone "extremely visible" kittens in this photo!!! I was fairly clear that I could see the silhouette of the landscape, but could not see the beach. It is a clear sign of desperation that your arguments are so quickly moving away from your flawed logic, and towards my person. I will now withdraw my benefit of the doubt. You're trying to lie to us because you want the article down. It's not happening, and the record of your attempts is public for anyone to view. I appreciate your input SexWarrior, but at this point, I can find no basis in reality for your accusations of lying or flawed logic. I was hoping for a more clever tactic from you than just repeated baseless accusations. As such, I see no point in continuing to argue. Hence my original response: "K". Please refrain from making low-content posts in the upper fora. Tom could clear this up easily. All he has to do is post what to clarify what he was able to see with the naked eye. 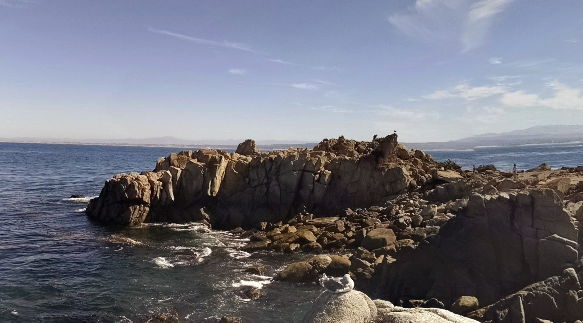 One reason I knew right away the distances were wrong when I read the experiment is I sailed to Monterey Bay. I was no further than about a 1/4 n.m. away from where he claimed to lay down and make his observations in my dingy during that trip. The 3 days I was there the visibility was good and I could see the shore that Tom claims was visible. I could not see the waters edge but the higher ground behind it. I carry a very good pair of binoculars and spotting scope on my boat. I find them very useful for navigation and consider them very important safety equipment. I have high standards for the optics I buy. Every time I anchor I note landmarks and get bearings. Which allows me to determine if my anchor is dragging more easily and not entirely rely on my GPS. Using either of those optics I could not see the beach(water's edge) Tom claimed to see so clearly. I only used the binos as I entered the bay to anchor about 1 n.m. north of Lover's Point. Both when I anchored East of Wharf II. Of course I was not actively trying to see the beach nor did I expect to be able to at that distance. Yes, yes, pointing out simple facts is so unreasonable, I should be ashamed for pointing out your contradictions and "errors". I'd take your point on board (and ascribe it to previously documented incompetence) if not for the fact that you don't need to try and find anything. It's been all spelled out for you multiple times, and your best response is "I totally can't see your point!". I'll continue to document your dishonesty and desperation for as long as you keep adding to the pile of evidence. I'm sure a thorough record will come in handy in the future (as your original complaint argued, one's track record impacts on their credibility). Please, do go on. So did the problem get resolved? Tom is still conspicuously ignoring this thread, and the experiment is still in the wiki, so... no.